Based on reviews from 618 experts and 24,391 users. 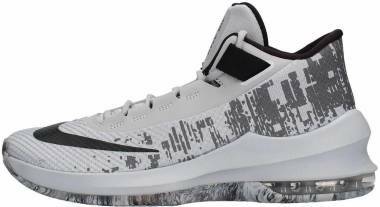 Learn how our rankings work or see our guide to grey basketball shoes. Updated Apr 2019. 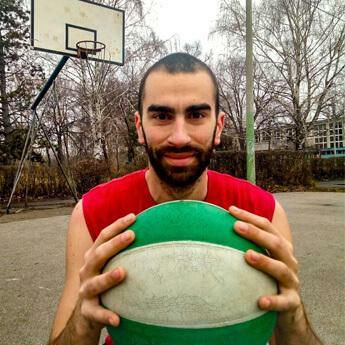 Basketball has always been a famous and loved sport. It was developed in the late 19th Century by Canadian physical education instructor Dr. James Naismith in Springfield, Massachusetts. It only had thirteen rules. The purpose was for young students to be conditioned during the cold season. His eighteen students were divided into two teams. He taught them the basics by letting them throw a soccer-style ball to peach baskets. On March 11, 1892, the first public basketball game in Springfield, Massachusetts was played. In as early as 1907, Spalding had already produced the first ever basketball shoes. This contradicts most reports that the first pair were seen only in 1917. The first pairs had a high cut called the “Blucher cut.” These vintage basketball shoes were handmade using heavy canvas and leather, pretty much like standard boots. The leather from the ankle collar down to the toe cap was from a kangaroo calf’s hide, which is said to be more flexible and durable than cowhide. The Converse Rubber Company and A.G. Spalding & Bros were the leading manufacturers of basketball shoes. They also introduced rubber suction outsoles. After the first World War, basketball shoes became more popular as Converse came up with the Chuck Taylor, which was and still known also as the “Chuck Taylor All-Stars,” “Converse All Stars,” “All Stars,” “Cons,” “Converse,” and “Chucks.” These high-top shoes were marketed under the name "Non-Skids." The original releases featured a white rubber toe cap, a stitched cotton canvas upper, and a brown rubber outsole. The first Swoosh basketball shoes were the Nike Bruin and the Nike Blazer, which were leather high-tops released in 1972. In the next two years, a low-top version of the Blazer and suede versions of both shoe models were released. Interestingly, the Nike Bruin Mid came out only in 1977, and it came with a twist. It featured a suede trim at the toe cap and side panels, which are common high-wear areas. The Nike Bruin and Nike Blazer became so widely popular that they have been released in hundreds of colorways, in low- to high-top versions, and using different types of upper materials. Though they are no longer fit for basketball, these sneakers still receive so much love from people of all ages and gender. These classics surely retain the appeal they had when they debuted on the court. In 1984, Nike launched the Air Jordan series for NBA superstar Michael Jordan. Designed by Peter Moore, the Air Jordan 1 was released in a black and red colorway with minimal white accents. The AJ 1 was eventually banned from the NBA, but the brand saw the ban as an opportunity to advertise the shoe. The shoe model has been remastered and re-released through the years in many different colorways and looks, including as gray basketball shoes. 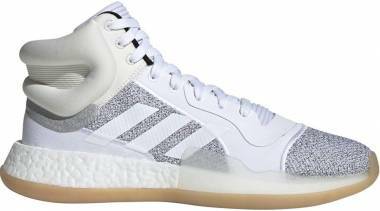 The first Adidas basketball shoes were the low-top Adidas Superstar introduced in late 1969. It had a huge impact on the league because of the good protection and support that it delivered. It came with a “shell toe” that provided protection. The Adidas Superstar was famously worn by the great Kareem Abdul-Jabbar and fourteen-time All-Star and Finals MVP Jerry West. Decades later, the shoe starts to hit the streets more than the court. Reebok had already come a long way in basketball when it merged with the Three Stripes in the early 2000s. The Vector brand under Joseph William Foster started to handmake running shoes in 1895. The Reebok Pump was introduced in November 1989. Jacques Dominique "The Human Highlight Film" Wilkins, a nine-time NBA All-Star and one of the greatest dunkers in the history of the NBA, appeared in a commercial for the Reebok Pump. Under Armour joined the athletic apparel industry in the mid 90s but did not start producing basketball shoes until 2011. The first basketball shoe that Under Armour produced is the Micro G Black Ice. It was endorsed by Brandon Jennings, a point guard in the Milwaukee Bucks. In 2013, Under Armour brought in Stephen Curry as its first signature basketball athlete. Sales rapidly increase and Under Armour eventually becomes one of the most formidable forces in basketball together with Nike and Adidas. A newcomer in the basketball shoe industry, Anta designed their first NBA basketball shoes for power forward Kevin Garnett. The luxuriously packaged Anta KG 1 was released in 2010. The shoe model is part performance and part lifestyle, and it comes with a white full-grain leather upper with black leather detailing. When purchasing footwear, most men choose only between black, blue, or gray basketball shoes. They find these colors attractive, easy to match with outfits, and above all masculine. Either in light or dark shades, gray basketball shoes pair well with bright and dull colors. Definitely, not all gray shoes look nice with suits in formal events. Gray footwear is usually seen on courts and the streets. 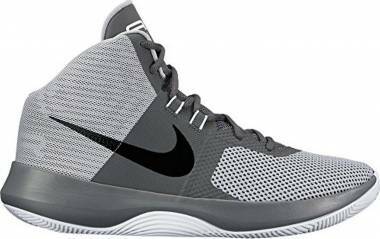 Discussed in the subsection below are top grey basketball shoes from some of the most competitive shoe brands today. Nike HyperRev 2015. 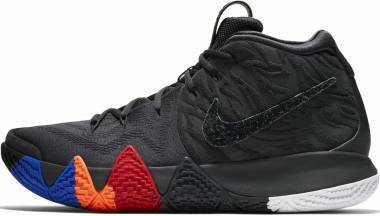 The Nike HyperRev 2015 is a mid-top basketball sneaker with a light one-bootie construction. The upper is a combination of a three-layer Hyperfuse and a one-piece neoprene inner bootie. The neoprene material delivers a glove-like fit while the Hyperfuse provides durability and ventilation. The midfoot has the Flywire technology that helps with foot containment. Two Zoom Air units are embedded in the Phylon midsole for responsiveness. The altered herringbone on the soft and pliable outsole rubber works well on indoor courts for as long as the pattern is kept clean. 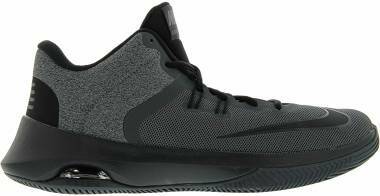 The Nike HyperRev 2015 Wolf Grey comes as all gray basketball shoes. 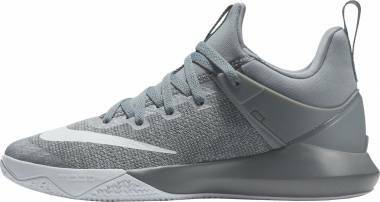 Another option for those who love gray basketball shoes is the Dove Grey/Classic Charcoal/Hot Lava colorway. Nike Zoom Evidence. The Nike Zoom Evidence is a budget model that has a Phylon midsole with Zoom at the forefoot. The upper is made of lightweight mesh panels and seamless synthetic overlays. It has the Flywire technology at the midfoot to provide superior foot containment. The Nike Zoom Evidence Game Royal/White/Wolf Grey and the Zoom Evidence Cool Grey/Black/White/Dark Grey are predominantly grey basketball shoes. Nike Zoom Shift. The affordable Nike Zoom Shift comes with a forefoot Zoom unit encased in its Phylon midsole. Its outsole is made of translucent and solid rubbers. The tread pattern on it extends up to the sides for more stability. The lightweight mesh and textile upper ensure all-day comfort. This model is available as all gray basketball shoes with white and orange outsoles. Nike LeBron 15 Low. 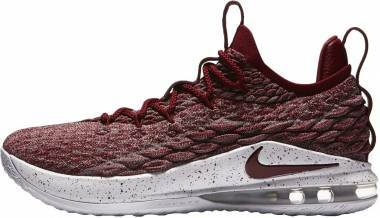 Considered as one of the most attractive LeBron shoes of all time, the Nike LeBron 15 Low has a durable Battleknit upper with a three-dimensional reptile effect on the side panels. The midsole boasts the Zoom Air at the forefoot and visible Air Max units at the heel. A multidirectional triangular and spiked traction pattern is on the translucent rubber outsole. The Sail colorway of the Nike LeBron 15 Low is a dope gray basketball shoe. Nike PG1. The black and gray basketball shoes of Paul George are low-top sneakers that feature a protruding forefoot Zoom unit for impact absorption and court feel. It doesn’t matter whether it’s on a solid or translucent rubber outsole; the multidirectional traction pattern always works well. However, on dusty courts, the outsole needs some wiping from time to time. Together with the shoe’s sock-like fit, the midsole peak on the rear panel provides stability and protection from ankle injuries. The upper comes in a breathable mesh and textile for comfort. The Nike PG1 is one of the cheapest gray basketball shoes of 2017 that many enjoy. 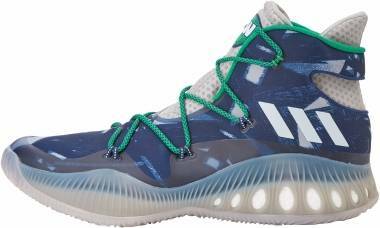 Adidas Crazy Explosive 2017 Primeknit. 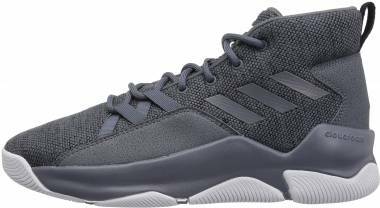 The Adidas Crazy Explosive 2017 Primeknit comes as one of the best gray high top basketball shoes in 2017 if you get its Triple Grey colorway. The midsole boasts a full-length Boost cushion in a thermo polyurethane cage. The coral-inspired traction pattern provides a maximum grip on floors. The Primeknit upper features a unique wave pattern for durability and flexibility. Adidas Crazy Explosive. In 2016, Adidas released a beastly basketball shoe that makes reviewers scream from excitement. The shoe’s full-length Boost midsole absorbs impact and returns energy. The anatomical lace system reinforces the already secure foot containment provided by the Geofit upper. 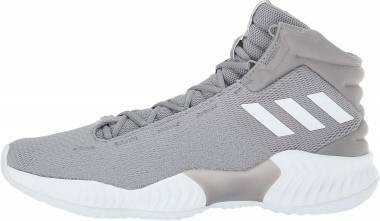 The Adidas Crazy Explosive comes as gray basketball shoes in Solid Grey/White and Heather Grey versions. 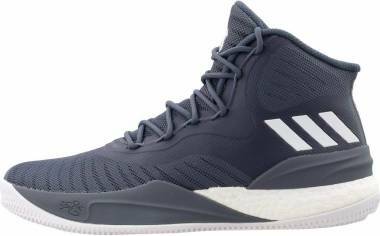 Adidas D Rose 5 Boost. Derrick Rose’s fifth signature shoe comes with a firm full-length Boost cushion that provides superior responsiveness. The outsole has a wavy traction pattern with soft and pliable grooves. Because of the SprintFrame technology at the heel, the foot is well contained. The synthetic leather and mesh upper delivers durability and ventilation. 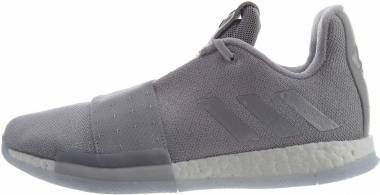 This model comes as gray basketball shoes in over six styles: Home Gray, Home, Alternate Away, Brenda, Fleece, and Holidays. Adidas D Rose 773 IV. Derrick Rose has a budget line dedicated to his beloved hometown. The Adidas D Rose 773 IV is the fourth installment in the series. 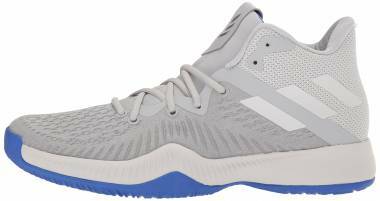 These grey basketball shoes feature the Bounce technology at the midsole for better responsiveness and guaranteed comfort. Synthetic leather and mesh make up the upper of the D Rose 773 4 for a moist-free and durable wear. This mid-top basketball sneaker comes with a translucent rubber outsole. The multidirectional traction pattern in it is made shallow and segmented for superb court grip and control. Adidas Mad Bounce. The Adidas Mad Bounce has full-length Bounce for responsiveness. The outsole features a coral traction pattern with thick and deep grooves, preventing dust and debris from sticking. The upper is made of engineered mesh that help wick away moisture. The knit rear panel and neoprene tongue provide a glove-like fit. 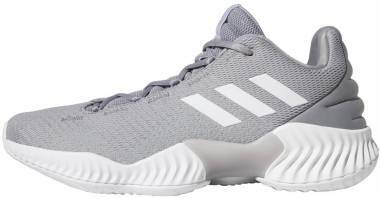 The Adidas Mad Bounce comes as gray basketball shoes with white shoelaces and a white outsole. Another colorway available is the Utility Black/Core Black/Grey. Jordan CP3.IX AE. 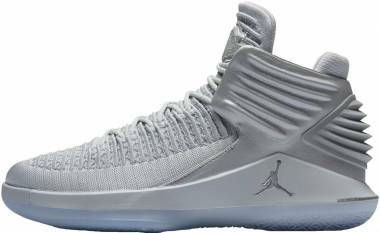 The eleventh signature model for Chris Paul has artisan edition gray basketball shoes that do away with the original model’s foam-backed mesh. In its place, the AEs have engineered mesh. Their midsoles are made of phylon with a bottom-loaded forefoot Zoom unit that effectively absorbs impact. The outsole comes in either solid or translucent rubber with herringbone and arrow-like patterns for a multidirectional grip. The Christmas and Oreo versions are gray basketball shoes that wearers will love. Air Jordan 8 Retro. The Air Jordan 8 Retro has a unique lockdown mechanism that provides excellent foot containment. The inner walls of the shoe are padded and the midfoot has a criss-cross strap and a traditional lacing system. This creation by Tinker Hatfield boasts either a suede or nubuck leather upper that is both stylish and durable. The original AJ 8 had a polyurethane midsole, but the retro changes it to the more stable EVA foam. The outsole features both flat and rough surfaces with holes of different sizes. This setup has a surprisingly great grip on courts. The Air Jordan 8 Retro comes as all gray basketball shoes when you get the Cool Grey colorway. Some of the other versions available are the Bugs Bunny, Suns, Chrome, and Aqua colorways. Jordan Ultra.Fly 2. The responsiveness of the Jordan Ultra.Fly 2 comes from the forefoot and heel Zoom units that are wrapped in a lightweight injected Phylon midsole. For greater friction, the Ultra.Fly 2’s solid or translucent rubber outsole boasts a multidirectional traction pattern. The one-bootie knit upper with a standard lacing system ensures a secure lockdown. The Wolf Dark Grey colorway of this model is for those who love gray basketball shoes. Air Jordan 5 Retro. 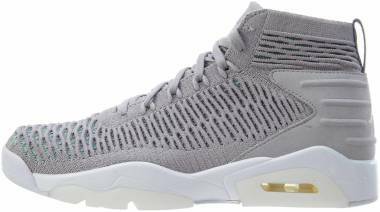 The Air Jordan 5 Retro features Air cushioning at the forefoot and heel. The soft and translucent outsole rubber comes with a herringbone traction pattern. 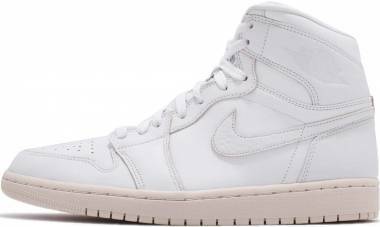 The upper comes in either nubuck or split-grain leather. The shafts at the side panels give the shoe breathability. Green Bean, Burgundy, Tokyo 23, Wolf Grey, Gamma, and Fresh Prince versions are dominantly gray basketball shoes. Air Jordan 4 Retro. 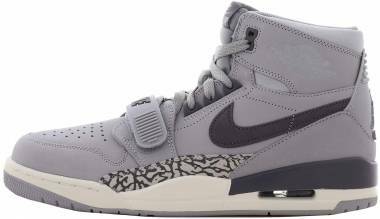 The first Air Jordan shoe to be released globally, the Air Jordan 4 came as a memorable pair of gray basketball shoes in the 1988-1989 season. The AJ 4 Retro has a polyurethane midsole and Air units at the heel. Regardless of whether it is made of solid, translucent, or gum rubber; the outsole always comes with a herringbone traction pattern. The upper of the retro version is made of a combination of full-grain and synthetic leather with mesh panels for breathability. Those who love gray basketball shoes will surely love these colorways: White Cement (2016 Release), Alternate, Alternate 89, Toro Bravo, Oreo, Fear Pack, Bred (2012 Release), Countdown Pack, Green Glow, Kaws, Premium Pinnacle Snakeskin, and Cool Grey, just to name a few. Under Armour Clutchfit Drive 2. The Under Armour Clutchfit Drive 2’s step-in comfort is provided by the Micro G midsole. The outsole comes with a herringbone traction pattern that extends up to the medial side to provide support for hard cuts. The heel is securely contained by the internal and external heel cups. The durable and flexible upper features Clutchfit overlays on mesh and synthetic leather. The shoe comes in multiple colorways including an all grey basketball shoe. Under Armour Jet 2017. The Under Armour Jet 2017 is a budget model with a molded EVA midsole and herringbone traction pattern on the outsole. 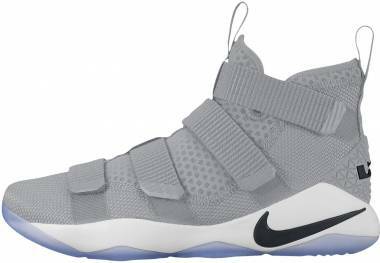 The inner walls and tongue of these gray basketball shoes contain enhanced padding for comfort. The synthetic leather and textile upper promises durability and breathability. 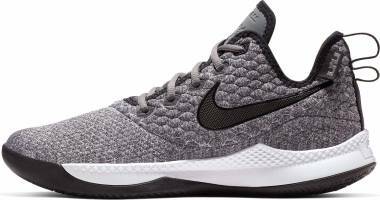 These cheap grey basketball shoes are also available in many shades and styles. Under Armour Curry 3 Low. The Under Armour Curry 3 Low boasts the Charged cushioning for impact absorption and all-day comfort. The shoe’s solid or translucent outsole rubber comes with a herringbone traction pattern. The upper features the Threadbone technology that is practically a weave of engineered micro threads. This lightweight material is breathable and flexible. 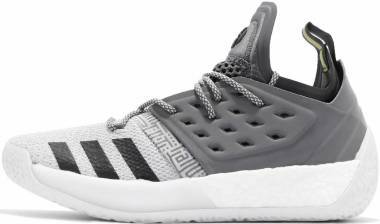 Those who love black and gray basketball shoes will surely get what they are looking for in the White/Grey-Aluminum colorway. Under Armour Rocket 2. 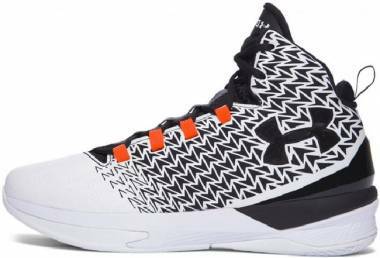 The Under Armour Rocket 2 is a shoe that an aspiring basketball player must try. These cheap gray basketball shoes boast the Micro G midsole and insole. The herringbone traction pattern on its solid one-piece outsole rubber grips well on any surface. The shoe features a unique tongue called the burrito, which allows these basketball shoes conform better to the shape of the foot. 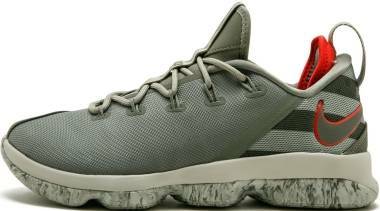 The Under Armour Rocket 2 is available in many shades of gray for those who find grey basketball shoes attractive. Under Armour Lockdown 2. 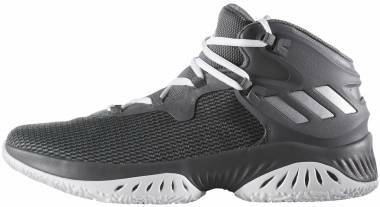 The Under Armour Lockdown 2 is one of the few gray high top basketball shoes that cater to wearers with wider feet. It comes with an EVA midsole for a responsive ride. The outsole has a herringbone traction pattern. The synthetic leather upper provides flexibility and durability. 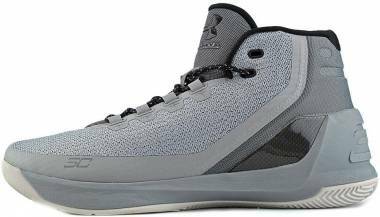 The UA Lockdown 2 is actually available as light and dark gray basketball shoes. Gray is basically a mixture of black and white. The word for this color appeared in the English language as early as 700 AD. In the Middle Ages, gray was the color worn by monks, peasants, and the poor. Every color has its own special meaning - both positive and negative. Some cultures define each color based on how they believe it affects their lives. The brightness and dullness of the colors tend to give meaning to their future and how things should be handled. So what does the color gray stand for? Light gray is said to be feminine in nature. It projects positive characteristics such as calming, soothing, reliable, reserved, elegant, intelligent, solid, mature, neutral, and professional to name a few. This is where the meaning of “the men in grey suits” comes from. This phrase, as you may recall, refer to neutral and/or reserved professionals who make important, intelligent, and reliable decisions. The color also refers to the gray hair of the elderly, to whom we usually ascribe authority and maturity. The masculine dark gray color denotes various forms of negativity such as sadness, depression, isolation, and indecisiveness. When applied to a person, dark gray may signal being cold and disinterested. How do sneaker fanatics maintain the neatness and cleanliness of gray basketball shoes? There are so many ways to clean gray basketball shoes. There are wearers who prefer to clean their kicks using short methods. Armor All Cleaning Wipes and Jason Markk Quick Wipes come in handy. These solutions do not get the sneakers wet so owners can rock them immediately. Washing machines are of great help, too, especially for people who prefer less manual work in cleaning the shoes. The shoelaces need to be removed and washed separately. The sneakers are placed in a shoe bag and placed in the washing machine filled with cold water and laundry detergent. Some who do not have washing machines, they go back to the old-school method of brush and soap. For tight areas that cannot be reached with shoe brushes, an old toothbrush can do the trick. How do wearers style gray basketball shoes? Some sneakers are not meant to be paired with pants. There are sneakers that look too good with long pants, but there are those who are only meant to be paired with shorts. Be sure to check your getup well before leaving the house, or perhaps ask for a second opinion. Slim-fit jeans are ok. Skin-tight jeans are a no-no because most basketball sneakers appear bulky. Slim jeans, however, are great partners. 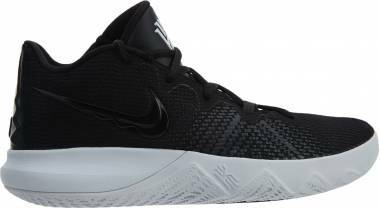 They present a more formal look and lessen the bulkiness of gray high top basketball shoes. Joggers are tricky. Joggers are complicated to match outfits with. They look great with running shoes but not with gray high-tops. Classic basketball sneakers are an endless hit. Older kicks are still many users’ go-to footwear for any type of event. There are even grooms and brides who use classic white and gray basketball shoes on their weddings. This does not imply that current basketball sneakers are hideous; it simply shows that older models with basic and/or neutral colors are still more welcome in decent or more formal getups. Roll thy jeans. When a wearer’s pants are quite long, the edges can be pinrolled but not too high. This method helps show off the beauty of the gray high-top basketball shoes. I love sneakers but I prefer cheap gray basketball shoes. How and where do I find them? This is a common question from those who love to acquire gray basketball shoes but cannot afford the expensive price. One practice of those who are unwilling to pay the original or release price is waiting it out until new releases are made. 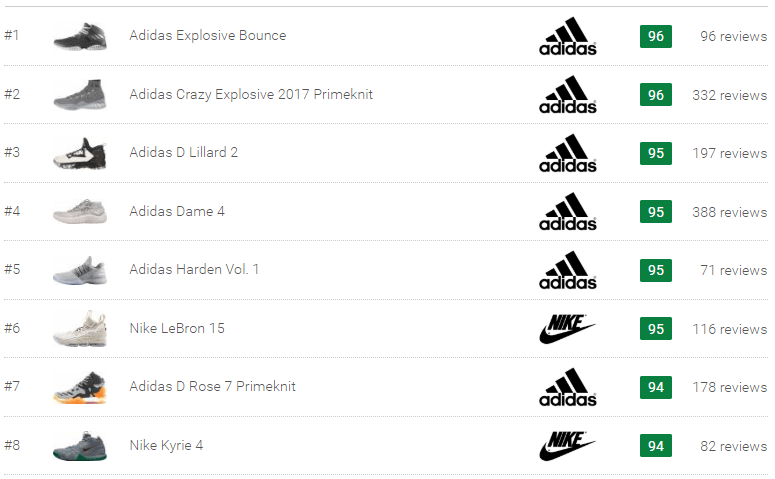 The new releases render the targeted basketball shoes “out of trend,” and this has a lowering effect on the targeted shoes’ prices. If this does not work, promo codes or coupons can help too.